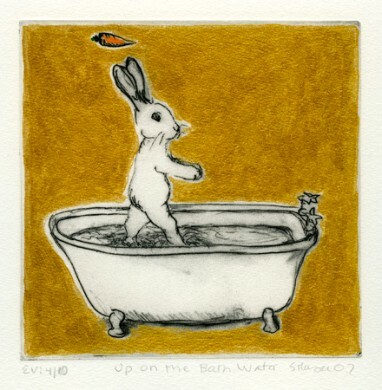 Above image: The Miracles of Hare-Boy: Up On the Bath Water, Sarah Hauser, 2007, Solarplate Etching with Metallic Paint, 7" x 7"
Also, please click the tab, "My Art Blog", to read more about my art process, etc. Or you can go to the blog directly at http://sarahhauserart.blogspot.com. Another aspect of my life is my work I do with animals. Please feel free to visit my website, http://healingenergyforanimals.com for more details about that. I also have a blog entitled "My Journey with Animals" at http://sarahsuricat.blogspot.com/. You may contact me at sarahhauserart@gmail.com. Sarah Hauser was born in San Francisco, and has lived in New York since 1979. She works in drawing, printmaking, sumi-e painting and sculpture. Her exhibitions have included Woodward Gallery (NYC), International Print Center of New York, Noho Gallery (NYC), Pen and Brush Gallery (NYC), Purdue University, Woman Made Gallery, Hiram Blauvelt Museum, Target Gallery, Washington Printmakers Gallery, and KIWA Exhibition and Tour in Japan. She studied drawing at the Art Students League and Spring Studio; sumi-e painting with Koho Yamamoto at Koho School of Sumi-e; and drawing, painting, printmaking and papermaking at Cooper Union, Manhattan Graphics, the Lower East Side Printshop and Dieu Donne Papermill. She has studied the Japanese method of woodblock printmaking with Jonathan and Miwako Glick, Kathy Caraccio, April Vollmer and Yasu Shibata. She was a resident monthly keyholder for seven years at the Lower East Side Printshop in New York City, and has also made prints at Manhattan Graphics Center, Robert Blackburn Printmaking Workshop and Kathy Caraccio Studio. She is in a number of collections, including Woodward Gallery, The Malloy Family Foundation; RM Fine Arts, London; University of Oregon; National Association of Women Artists; The Vivian & Gordon Gilkey Center of Portland Art Museum; Spencer Museum (University of Kansas), KIWA (Japan); Iowa University Print Society, The Iowa Biennial Exhibition Archive, NY Public Library, NY Historical Society, Kathy Caraccio Editions. Her work has been published in CALYX, Simple Printmaking and Japanese Woodblock Printing. Sarah is represented by Woodward Gallery in New York City.